(Nanowerk News) The surface of graphene, a one atom thick sheet of carbon, can be randomly decorated with oxygen to create graphene oxide; a form of graphene that could have a significant impact on the chemical, pharmaceutical and electronic industries. Applied as paint, it could provide an ultra-strong, non-corrosive coating for a wide range of industrial applications. Graphene oxide solutions can be used to paint various surfaces ranging from glass to metals to even conventional bricks. After a simple chemical treatment, the resulting coatings behave like graphite in terms of chemical and thermal stability but become mechanically nearly as tough as graphene, the strongest material known to man. The team led by Dr Rahul Nair and Nobel laureate Sir Andre Geim demonstrated previously that multilayer films made from graphene oxide are vacuum tight under dry conditions but, if expose to water or its vapour, act as molecular sieves allowing passage of small molecules below a certain size. Those findings could have huge implications for water purification. 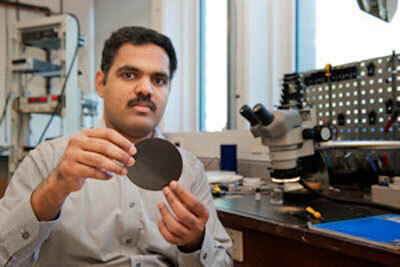 Dr Nair with a graphene membrane. This contrasting property is due to the structure of graphene oxide films that consist of millions of small flakes stacked randomly on top of each other but leave nano-sized capillaries between them. Water molecules like to be inside these nanocapillaries and can drag small atoms and molecules along. In an article published in Nature Communications this week ("Impermeable barrier films and protective coatings based on reduced graphene oxide'"), the University of Manchester team shows that it is possible to tightly close those nanocapillaries using simple chemical treatments, which makes graphene films even stronger mechanically as well as completely impermeable to everything: gases, liquids or strong chemicals. For example, the researchers demonstrate that glassware or copper plates covered with graphene paint can be used as containers for strongly corrosive acids. The exceptional barrier properties of graphene paint have already attracted interest from many companies who now collaborate with The University of Manchester on development of new protective and anticorrosion coatings. Dr Nair said "Graphene paint has a good chance to become a truly revolutionary product for industries that deal with any kind of protection either from air, weather elements or corrosive chemicals. Those include, for example, medical, electronics and nuclear industry or even shipbuilding, to name but the few." Dr Yang Su, the first author in this work added: "Graphene paint can be applied to practically any material, independently of whether it's plastic, metal or even sand. For example, plastic films coated with graphene could be of interest for medical packaging to improve shelf life because they are less permeable to air and water vapour than conventional coatings. In addition, thin layers of graphene paint are optically transparent."